I still can't believe how quickly it's come around this year, but I'm finally starting to getting excited about Christmas and getting into the festive swing of things. 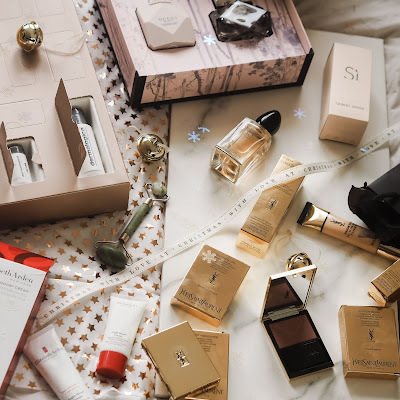 I've done around half of my Christmas shopping so far (pretty organised for me), and whilst on the hunt for my final few bits, I thought I'd make a little guide for you guys of my favourite gifts for her. 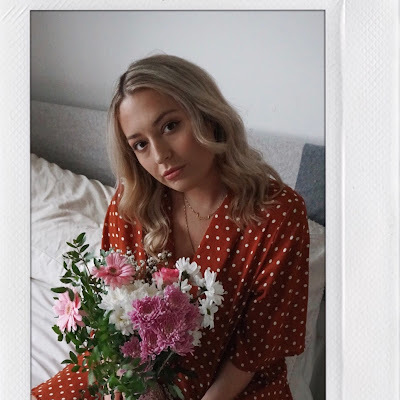 I personally would love to find any of these items nestled under the tree, and think they'd make the perfect gift for your fashion-loving bestie, sister or mum this Christmas. They're some fail-safe choices guaranteed to help you nail gift giving, even if it's a treat for yourself (you've earned it!). The two candles I've featured I've put to the scent test – Baies by Diptique has got to be one of my most favourite smells in the world, not just for the festive period but it's a great year-round scent too. This Voluspa Goji candle by Anthropologie is also another gorgeous one, I make a point of hunting it down and having a good ol' inhale of its delicious scent every time I visit the store. This one is only £26 and quite a nice big size too. 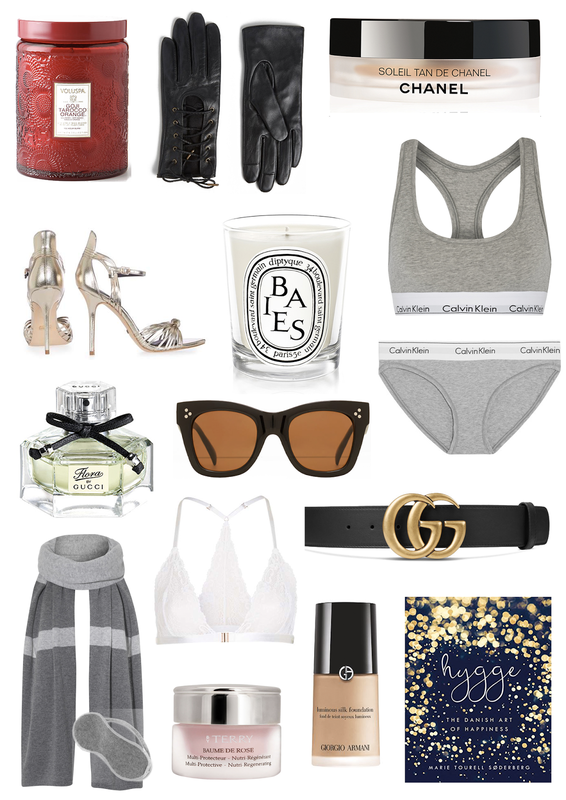 Then there's some timeless staples that every girl needs – the Calvin Klien set has been on my wish list since forever, and things like a good pair of leather gloves or statement sunglasses (these Celine-esque ones are actually Mango!) are absolute fail-safes. Books always make a lovely gift too – and what more apt than the trending 'Hygge' Danish Art of Happiness book for this time of year, I'll definitely be picking one up in the airport on the way to Copenhagen next week! For the beauty-lover, these treats are guaranteed to brighten up their pile of presents on Christmas day. I'm yet to try By Terry's Baume de Rose but have heard only amazing things, and it'll add that perfect bit of luxury to a gorgeous Christmas gift. I have however tried the Armani Foundation (best I've ever used) and Chanel bronzer so can vouch that these beauty treats will 100% go down oh so well. I also had a spritz of my best firends Gucci Flora Gracious Tuberose perfume the other day and it's such a beautiful fresh and unique take on the orignal scent. For those extra luxury ideas for that extra-special someone, try this gorgeous cashmere scarf & eye mask travel set by Me + Em. They kindly gave me a set before my trip to New York and it's one of my absolute favourite luxury bits I own. Not only were they perfect for my flight (I slept the whole 8 hours on the way home!) but I love snuggling up with them at home or wearing the scarf on those extra cold days. The perfect thoughtful present for someone that travels often, or just likes to get down right cosy. Then of course, the it-piece of the moment, the Gucci double G belt. I'm sure any style loving girl like me would be over the moon to unwrap this one on Christmas day and it's something they'd wear outfit upon outfit year-round. Hope you enjoy my top picks for her this year! Let me know if you'd like to see a 'for him' version and keep your eyes peeled for my 'Christmas Shop' page launching this weekend. Shope everything via the links below!